This revelation began when I happened to stumble across chef Drew Swint of Native Foods Café performing a cooking demonstration while Cherle Link, Director of Sales and Catering for Native Foods, proudly showed off their exquisite full-colored cookbook featuring some of Native Foods’ best recipes. 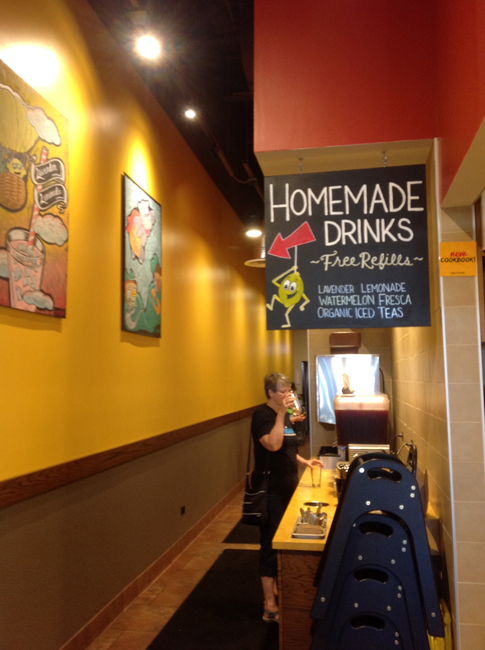 Connecting on a “gut” level, as only foodies can, Cherle and I made a date to visit Native Foods Café in River Forest in late afternoon, once Sunday’s cooking demonstrations were behind us. 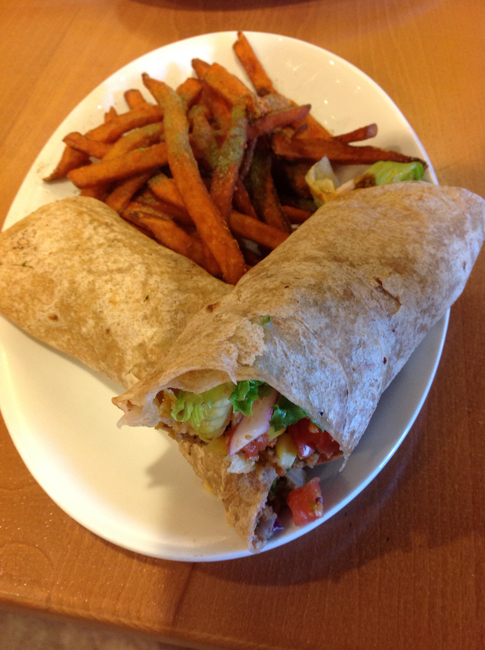 Native Foods is not the new kid on the block. It’s been in operation since 1994 and has opened 25 stores nationwide, largely in the midwest and the west coast which explains why we had never crossed paths. 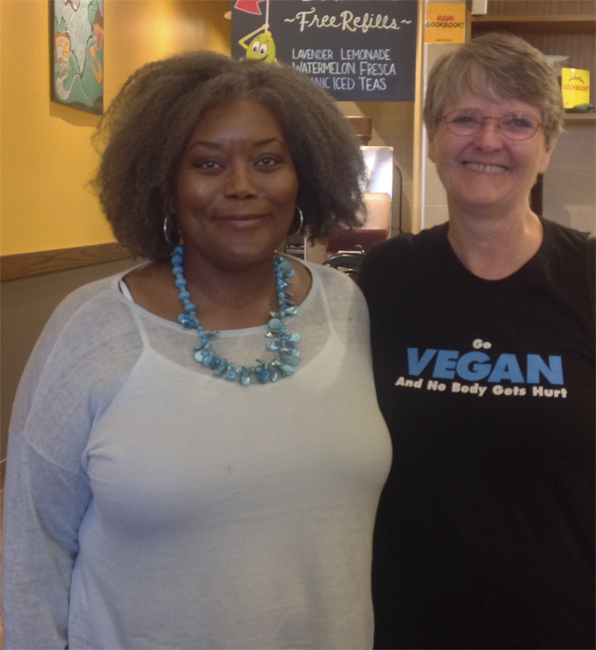 (Veggin’ Out and About! has been largely an east coast operation slowly gaining popularity in the mid and western states.) The food is reasonably priced with entrees at less than $10. 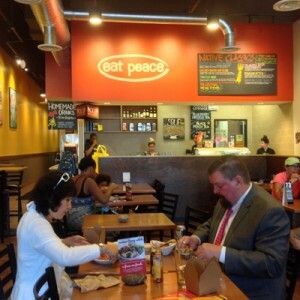 We chose to visit the River Forest location for its proximity to the festival. We found it located in a trendy strip mall next to Panera Bread and perpendicular to a Whole Foods market in River Forest. While it appeared to be a fairly small establishment, there was plenty of seating in an environment that was casual and uncluttered. We slid into a four-seater with Cherle and her partner, Mike, and hunkered down for some serious eating. The chefs know what they are doing, juxtaposing sweet and sour flavors with bitter and piquant. 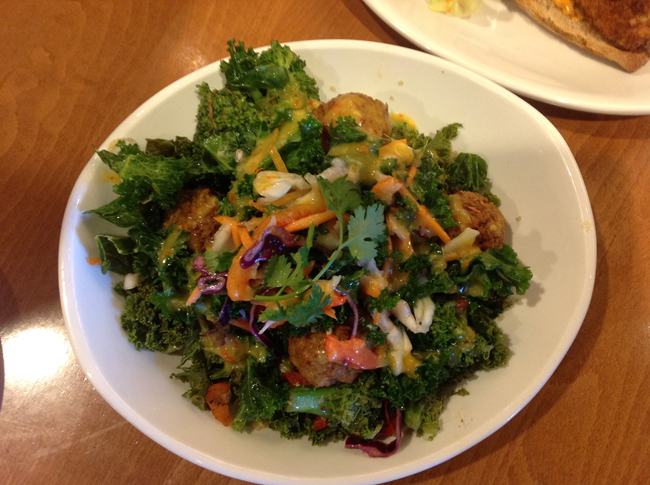 Our first dish was one of Native Food’s Earth Bowls, the Thai Meatball. The meatballs are made from seitan (wheat gluten) and are tossed with a mango-lime chili sauce. Sweet, tart and peppery accents merge to create a flavor explosion that is balanced and at the same time exciting. What we found most amazing were the faux-meat dishes. If I didn’t know better I would have sworn that the “chicken” dishes were in fact the tender white chicken breasts I remember from my days as an unenlightened carnivore. I had to keep reminding myself that no animals were harmed in the creation of my meal; the chicken is made in-house from non-gmo soy, pea and wheat proteins. The “bacon” is a soy product as well and has the smoky sweet flavor of real pork. It is incredible! 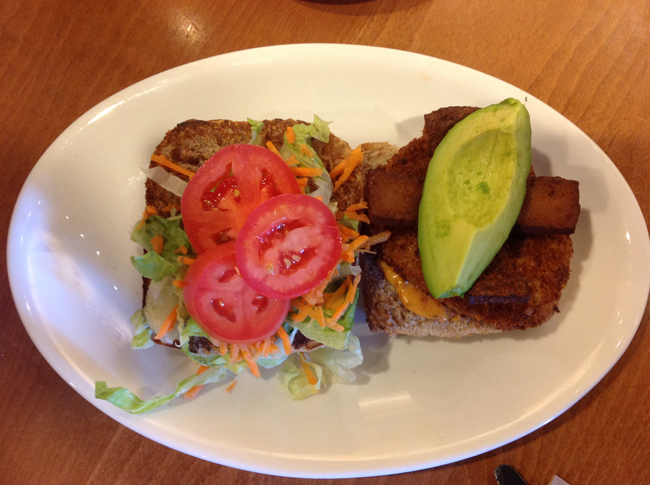 The numerous breads served at Native Foods are made in-house as well. Ashley Cox is an accomplished baker at the River Forest location. I have personally never been a fan of meat substitutes. 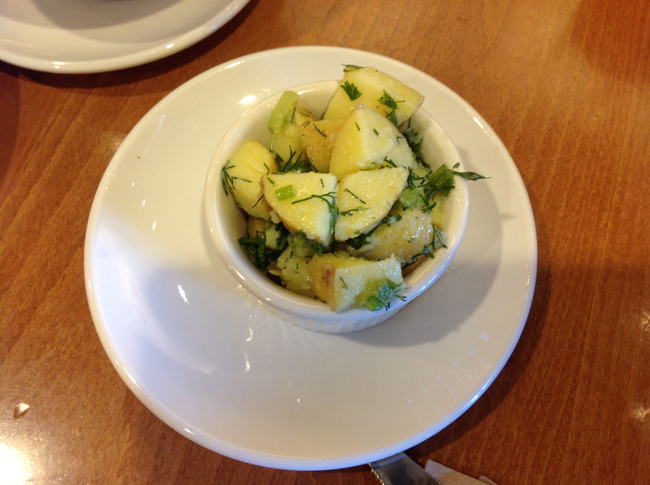 However, the meatless cusine of Native Foods Café has convinced me there is a place for these foods in my diet. They are a perfect transition food for those who would like to eat healthier but can not imagine giving up some of their favorite foods, like chicken, beef and pork. These dishes give you the texture, flavor and mouthfeel of animal protein without causing harm to our bodies, the environment and our animal friends. This is also a great place to take your carnivorous friends where you can all find something to please your palates. 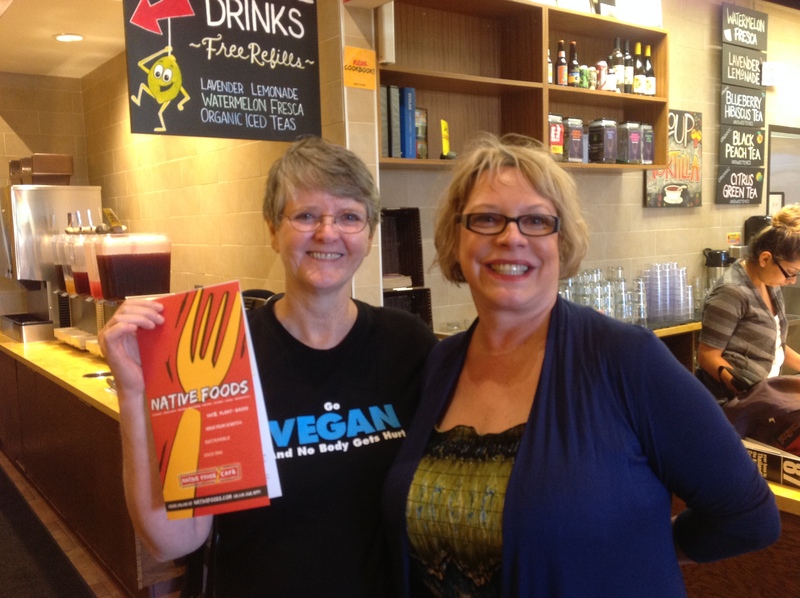 I chatted with another diner, Tracie Worthy, who shared with me that she and her husband, Thomas, dine often at Native Foods Café because they can both find food they enjoy. She is a vegan and her husband, Thomas, is not. It’s not an issue here because they both like the food. Yo Amigo Taco Wrap, a seasonal item. Native Foods has created a restaurant model that is able to produce high-quality whole foods on a scale that has been proven to be replicable. They began in 1994 and now have 25 stores nationwide. Native Foods has a plan for rapid expansion over the next four years to reach a total of 200 stores across the nation. 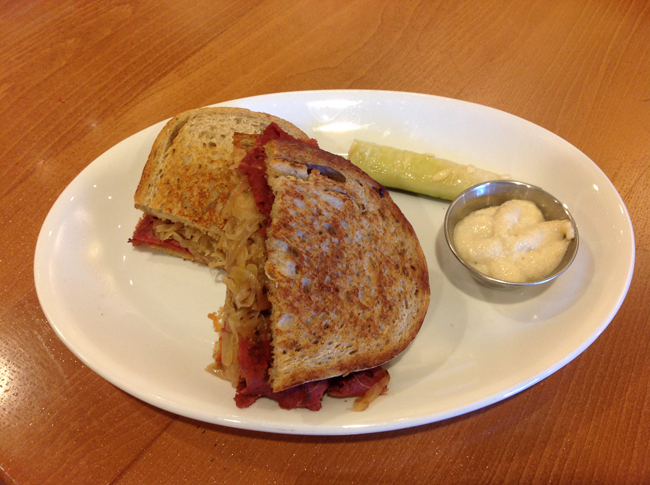 The Reuben: You would swear you were eating real corned beef! As yet another facet of their growth, Native Foods has just launched a catering program. Their model has been the Chicago area. Now they plan to offer this service at all of their stores. Clients can have events catered, such as business lunches and dinners for busy corporate offices, home parties, university parties, rehearsal dinners and any event where vegan food is desired. 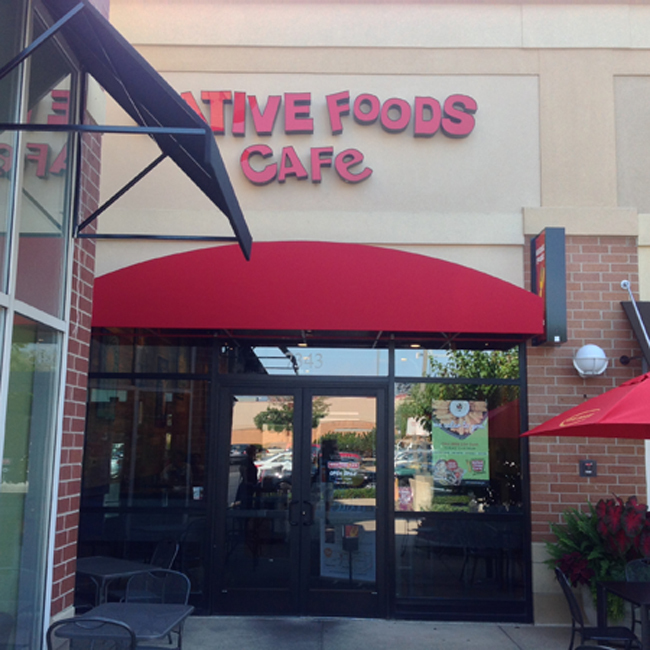 Native Foods aims to offer their catering services wherever their stores are located. Rich and I sampled more than 20 dishes and I have to say there was not a thing on the menu I wouldn’t order again, and again. Each dish retained it’s unique signature flavor giving the diner plenty of opportunities to try a completely different flavor profile on their next visit to Native Foods Café. Well… I suppose I should qualify that statement to admit I don’t think my waistline could survive endless servings of Native Foods’ decadent desserts. These sweet, creamy, and rich delicacies will leave your sweet tooth satisfied and your mind marveling that these are made dairy and egg free. 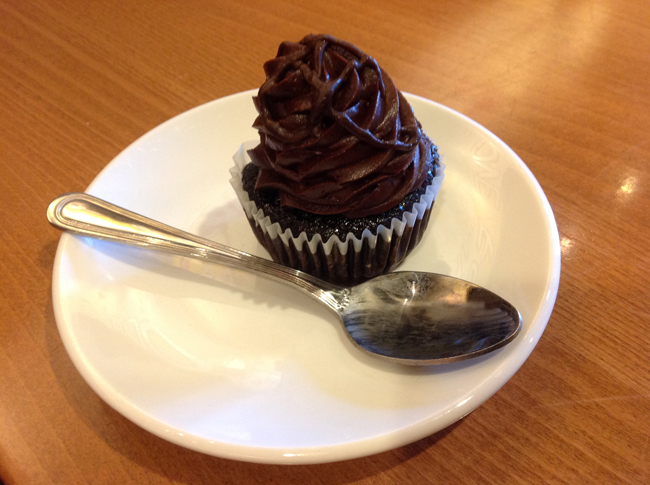 Chocolate Ganache Cupcake, offered seasonally. 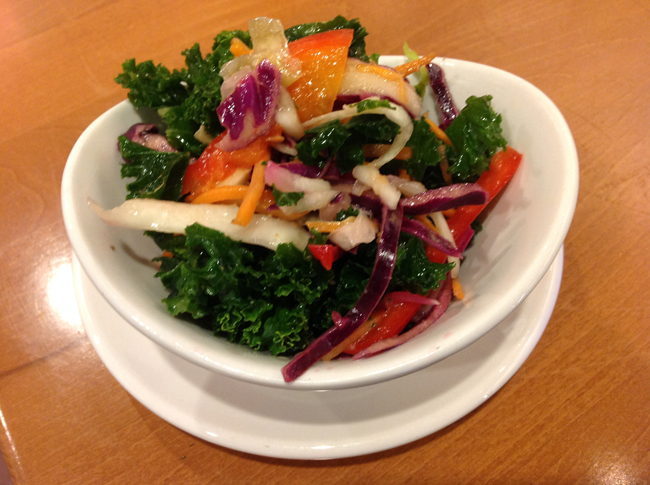 Whether you are vegan, vegetarian or just veg-curious, you owe it to yourself to check out Native Foods Café in one of their 25 locations from California to Washington, D.C. Look for their expansion to an area near you and visit their website if you’d like Native Foods to consider adding a location in your area. Native Foods catering services are likely to be an easy affordable solution to your next gathering. It is incredibly odd for a nationwide chain restaurant that prides itself on its health-conciousness to not publish any nutritional information on their dishes. I would venture that a greater percentage of the their patrons or would be patrons are interested in this information, than any other chain restaurant. These days even the likes of Taco Bell and McDonald’s are publishing and touting this data. Even though the ingredients are always (I eat there about once a week) fresh, II’d guess that Andrew is pretty close to the mark. I love the place but to be honest, a typical dish at Native Foods is probably not much better for you that say something from the Taco Bell Fresca menu and probably well below some of the choices at Subway. My guess is that if the nutritional information was out there, much of the marketing hype associated with Native Foods desired niche would quickly evaporate. Thank you for your comment, Kris. You may be right, and that goes for most restaurants we’ve visited. That’s why Veggin’ Out and About! is changing our focus from restaurant dining to education, and recommending to our friends that the only way to ensure a healthy. 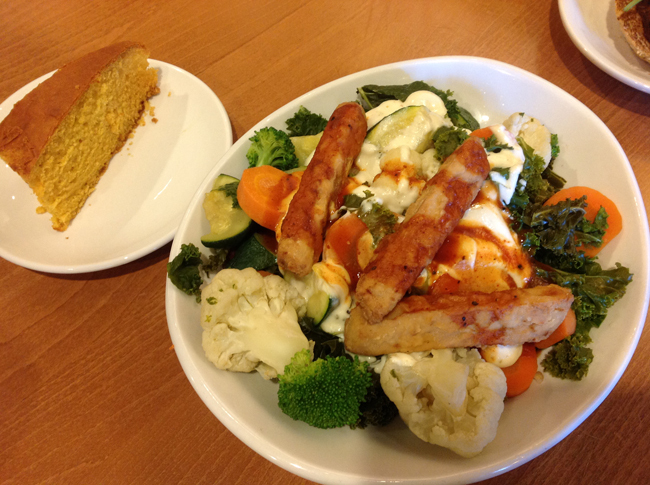 whole foods plant-based diet is to prepare it themselves in their own kitchens. We have found that virtually all restaurants resort to creating flavor with unhealthy fats and salt rather than organic ingredients and spices. The exceptions we have found have not survived in the industry very long because they could not compete with restaurants that opt for preparing foods with less expensive, less healthy ingredients. 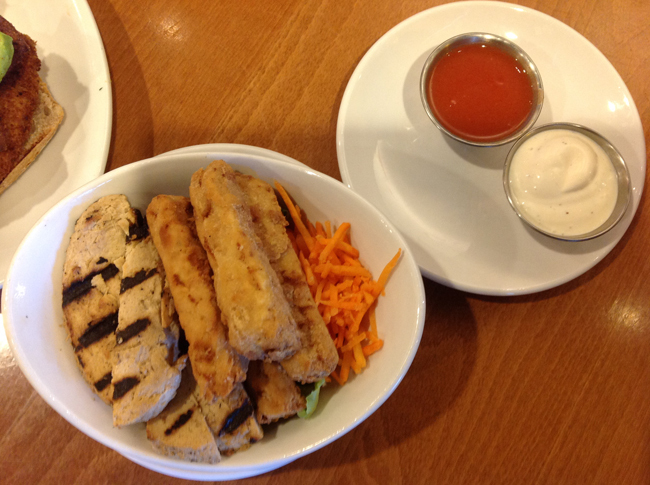 While you can mitigate the oil at Native Foods Café by asking for grilled options, it is safer, healthier and usually much more flavorful to prepare one’s own meals in which the entire process can be controlled. Having said that, I will certainly enjoy a meal at this restaurant should I be on the road, with friends, or just not feel like cooking. It certainly beats the likes of McDonald’s and Taco Bell. A steady diet from Native Foods will do nothing to prevent heart disease, stroke, obesity, diabetes, dementia. After I got over the initial joy of finding this restaurant chain, I started taking a closer look at their food. It’s about as unhealthy as vegan eating can get. What isn’t deep fried is slathered in oil. They even put 2 different oils in their sauerkraut. For the longest time they refused to publish nutritional information. They publish ingredients now but still refuse to publish caloric information. I seriously doubt any of their “burgers” have less fat and calories than a Big Mac®. I’m glad they’re vegan, but they are a long way away from being healthy. I’m sorry, Andrew, but I respectfully disagree. I have yet to find any restaurant with fresher produce than Native Foods, much of it locally sourced and all of it GMO-free. While many of the foods (such as the “chicken” dishes) are usually fried, you can request any of these dishes grilled. I discussed your comments at length with the management and was assured there is no oil used in making the saurkraut. I know I didn’t detect any when I was there and this is an issue I am sensitive to. There is oil on the bread but, again, you can eliminate that with a simple request. All bets are off on the desserts, however. Anything with lots of sugar and oil cannot be considered healthy, vegan or no. Except when reviewing a restaurant, I normally abstain from ordering these. I appreciate your comments and I hope you’ll give Native Foods another try. Some of the meals are meant to be indulgent. 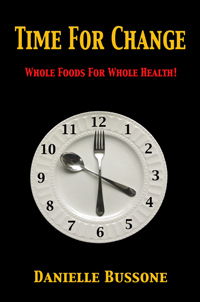 You do not need to eat healthy 24/7. The food is delicious and I have lost 50lbs but I want to go there today. And I will continue to lose weight and better my health even while I eat a huge plate of nachos. lol.